This one is pretty simple, just Quanta and Stiletto circling around each other. 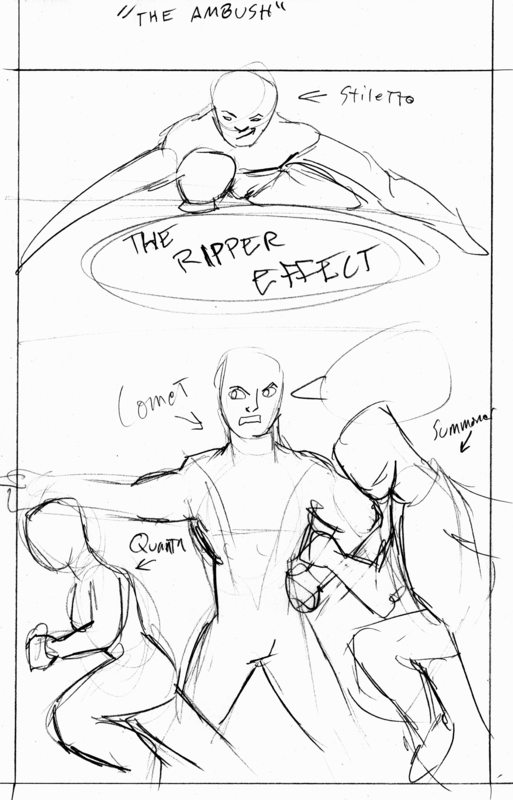 I admit the sketch doesn’t get it all the way there, but if this one wins I’ll fiddle around with the composition. 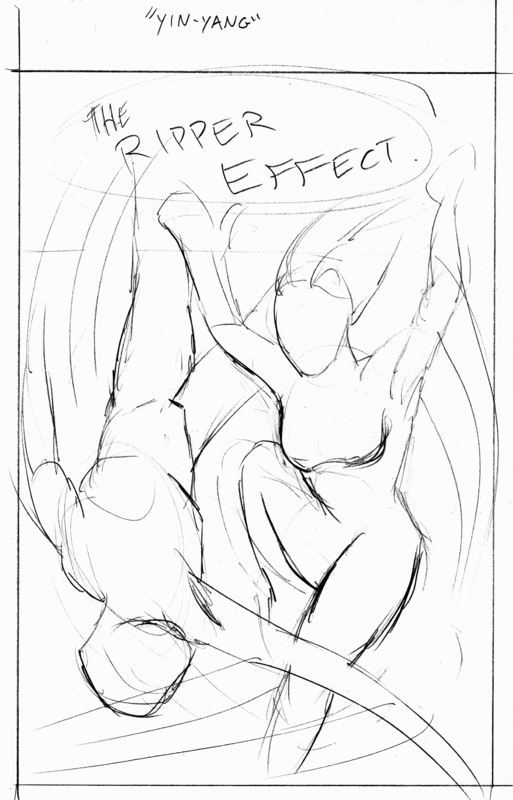 The idea is that they’re mirroring each other a little bit, even as he’s trying to murder her! It’s a table, with a bowl of cereal, a cereal box, and a milk carton. 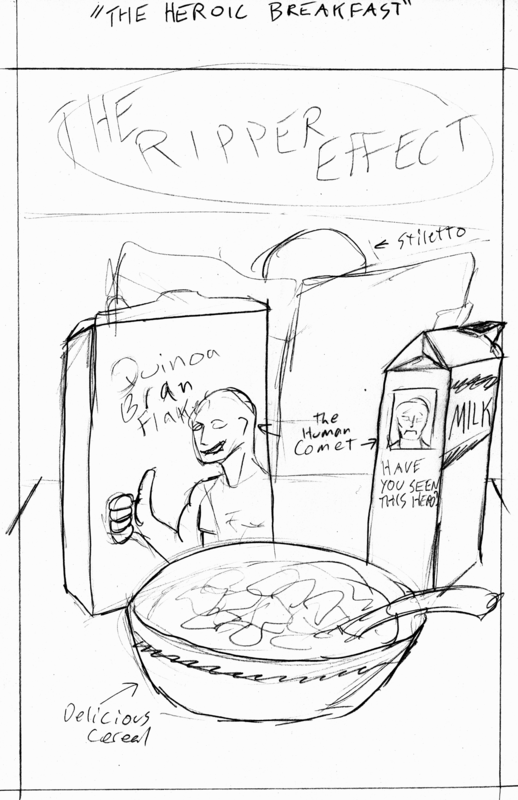 The cereal box has The Human Comet on it! And so does the milk carton, only it’s a classic “missing persons” type picture. In the background, Stiletto is reading a newspaper, but we can just barely see his forehead and fingers. And finally, we have “The Ambush,” based on a reader suggestion from Greg! Okay! Those are the choices! Please vote for what you think is the best one. And don’t forget to comment with your reasoning behind your choice and/or any suggestions for tweaks or modifications! The poll will close on Friday, April 28, 2017 at 5:00 p.m. PDT! Got something to say to me? Praise and/or a diatribe? Or do you have some wild speculation you want to share? Or do you want to see how evasive I can be in answering a question without giving up spoilers? Write a letter! We’ll have another letters page after the cover goes up! Email your question, digression, or dissertation to: issue2letters@3greenfish.net. Make sure to sign your name as you want to be listed. Letters may be edited for length, clarity, et hoc genus omne. I just like the feeling of the design in the yin yang one. I was out of town and offline all last week, so missed the official voting. I would have picked Ambush for a more serious cover, or Cereal for a more lighthearted cover, though I’d be intrigued to see how Yin-Yang would come out in a final version as well. Anyway, it looks like Cereal won, so that works for me!